What better day than a somewhat overcast Monday to shepherd myself and a tall, dark and handsome companion to Pimlico and disappear down some secret stairs into the soothing world of the Dolphin Spa. The spa itself is located within Dolphin Square. Located minutes from Pimlico Underground Station, Dolphin Square is not your classic London square with streets set round a communal garden, being instead a vast 1930s residential development overlooking a quite magnificent central garden complex. We checked into our apartment – a spacious and immaculate space several floors above the spa in the same building – then made our way down to the gym and swimming pool area. So far so Western – gleaming white, clean and smart. 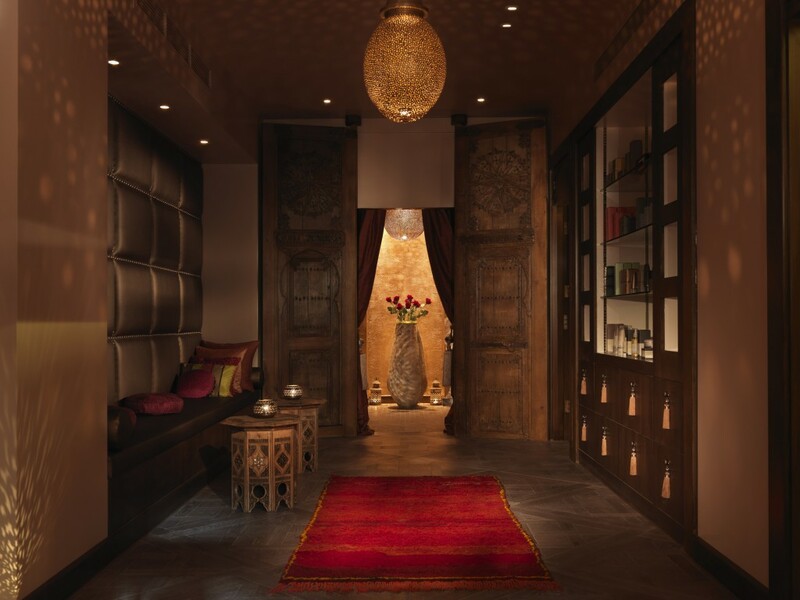 Step gingerly down those secret stairs, however, and you find yourself faced with the huge wooden doors to the spa. Walk through those doors, and everything changes. The interior has an instantly calming effect. The lighting, scent and gentle music provide a friendly yet profoundly calmative greeting. 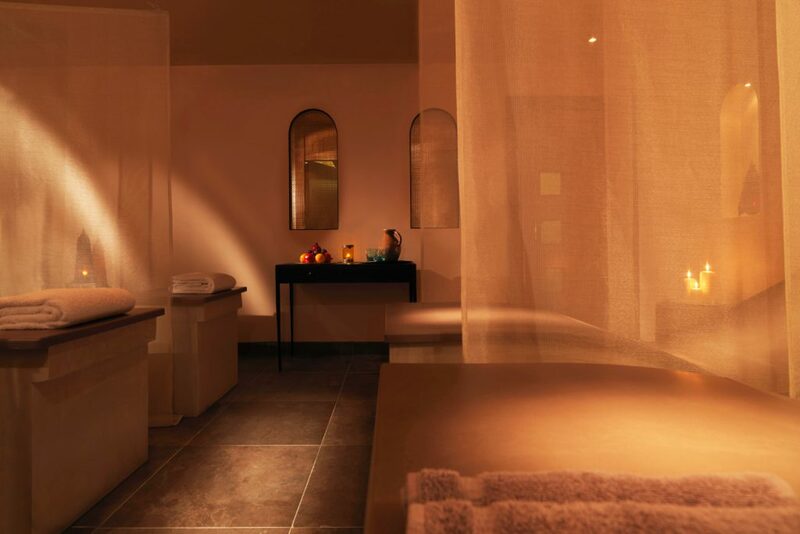 The spa manager emerged, smiling warmly and clearly keen to ensure from the outset that we were at ease and fully equipped to enjoy the experiences that lay ahead. I was impressed. In my experience, themed spaces rarely work outside of their country of origin; but the dimly-lit rooms, the Moroccan trinkets, the colours and textures were all so tasteful and authentic that I found myself almost believing that I had stepped into a (rather slick) Morocco. Tall, Dark and Handsome and I went our separate ways, stripped, showered and dressed in swimwear beneath fluffy grey robes, before taking a seat in an enclosed garden area where a traditional hand cleansing was performed. Warm water was poured on our hands from a golden jug and caught in a bowl held below. 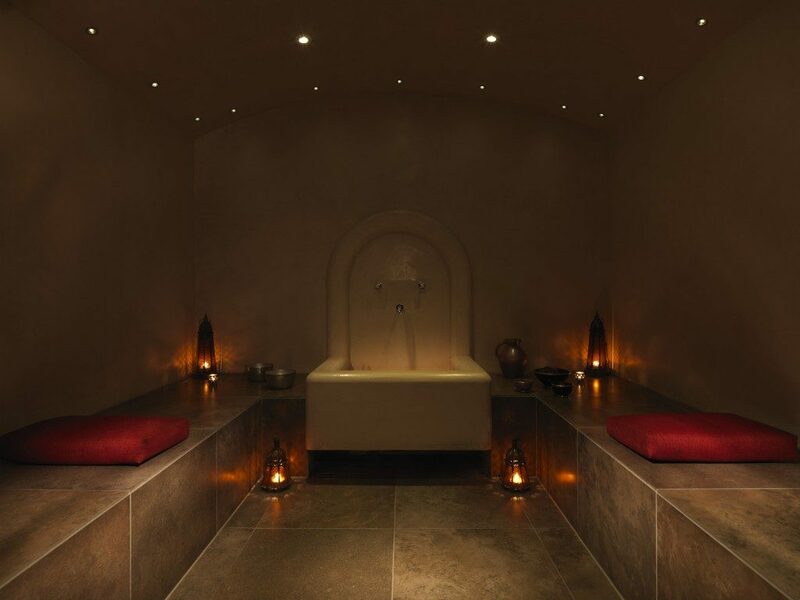 The spa treatments and rituals all use mineral-rich water drawn from Dolphin Square’s artesian well, the only remaining working well in the City of Westminster. 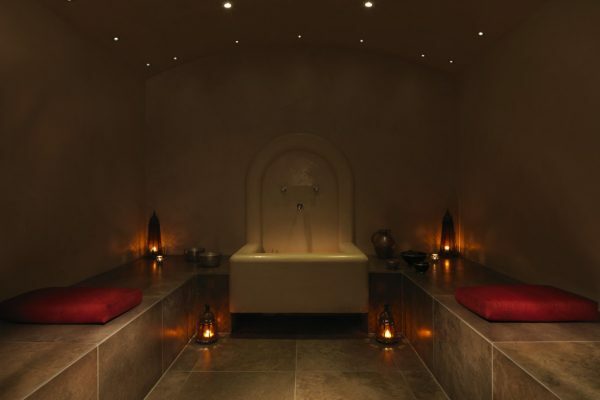 The hammam took place in a steamy, dimly-lit room, with marble slabs on either side and between them, at the far end, a large stone sink with huge taps from which the hammam mistress drew hot well water. I lay on one slab, TDH on the other. We were doused with hot water then our bodies were cleansed in turn with soap made from crushed olives, olive oil and eucalyptus, which was rubbed into the skin from neck to feet. You lie on your back and then turn over when instructed so that your covering can be complete. At this point I really started to relax as my body melted beneath the expert hands of the hammam mistress. Once the soap had been left on the skin for a few minutes an exfoliating mitt was used to remove dead skin cells and to improve circulation. Once again this was an all-over treatment and I felt ever more rejuvenated as it went on. We then stood up and an invigorating jet shower sprayed us clean. 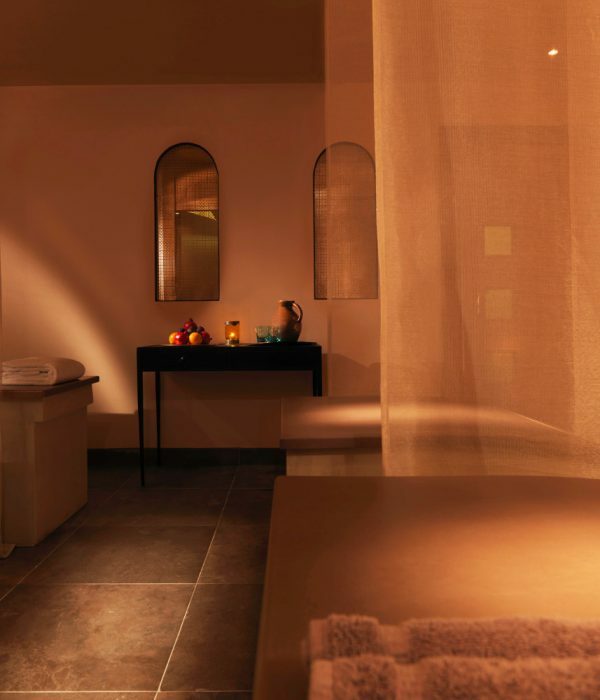 The treatment was wonderful, by turn blissfully relaxing and stimulating, and my skin was left smooth, soft and supple. We were led into the Tepidarium to lie on warm stone chaise-longues, set high off the ground. Sweet Moroccan tea was brought to us in a golden pot along with a decorative bowl of almonds, apricots and dates. The massage that followed was one of the best I have ever had. 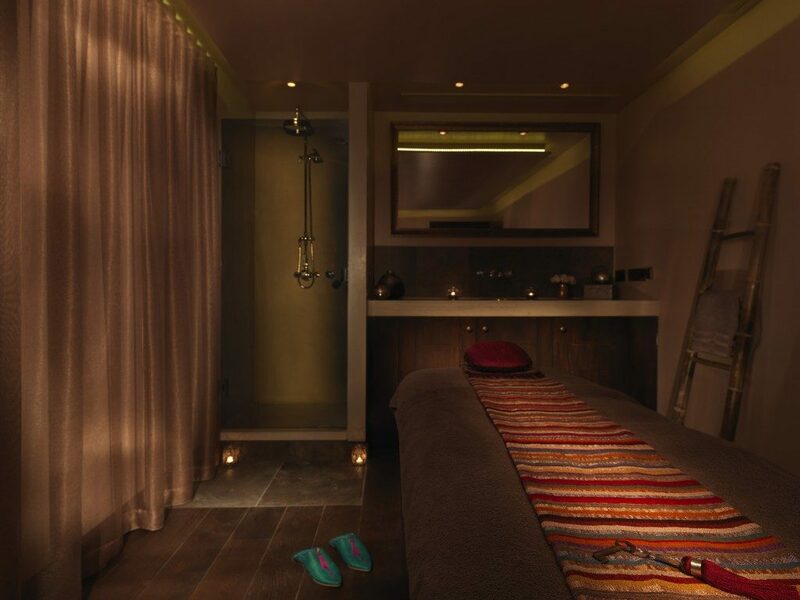 The massage room itself followed the overall theme of the spa, and I almost felt that I had disappeared down an alleyway away from a busy souk to take a well-earned break from my bartering and buying. I chose a green tea essential oil, known for it’s de-toxifying and reviving properties, to be added to the pure shea butter that was to be rubbed into my skin. I asked the masseuse to focus primarily on my back and she went about her task with skill and attention, applying a perfectly firm pressure and finding knots and tensions I didn’t even know I had, expertly working them out with her well-trained fingers. I almost disappeared into a reverie at the delight of the masseuse’s ministrations, and groaned inwardly when she brought her task to an end. However, she led me through to a charming relaxation room where I was invited to sit or lie down and enjoy the peace that the treatments had brought me. TDH soon emerged from his massage in a similar euphorically zombified state; and whilst he elected to read from one of the variety of magazines on offer, I simply lay there, drowsy yet elated. We were brought more tea and given time to collect our thoughts . . . or in my case to lose them. Nobody bothered us in the relaxation room. There was no discreet suggestion that it might be time to move along. We were allowed to remain as long as we wished, before dragging ourselves to the well-appointed changing rooms and blasting ourselves with wonderful showers before emerging once more from those huge wooden doors feeling clean, relaxed, refreshed and as new. The evening was spent relaxing in the beautiful serviced apartment. Apartment guests have at their disposal the sports and fitness club, with squash courts and a swimming pool, tennis courts and croquet lawn; they also have access to the shopping arcade, bar and restaurant and private parking; not to mention of course ideal proximity to the wonderful Dolphin Spa. This is one of the most gorgeous spas I have ever visited. A real sanctuary in a city space. Look out for me there, for I shall soon return.